Derived from endocrine pancreatic beta cells, insulinoma is a tumor of the pancreas, which also secretes insulin. Because surgical resection of the insulinoma remains the standard treatment for this tumor, and the size of the tumor is usually small, localization imaging with computed tomography (CT) or magnetic resonance imaging (MRI) is usually required[1, 2], but not always successful, again due to the limited size of the lesion. Recently, somatostatin receptor scintigraphy (SRS) has been introduced as a functional method for the detection of insulinoma. However, the relatively low incidence of somatostatin subtype receptors makes this method only achieve 40-60% sensitivity. In contrast, the Glucagon-like peptide 1 receptor (GLP-1R) is expressed in >90% of insulinomas with a mean density twice that of SSTR2. Clearly, an imaging probe targeting GLP-1R holds the great potential for insulinoma diagnosis. Since GLP-1R is highly expressed in insulinoma, ligands of GLP-1R could be converted into molecular imaging probes for insulinoma imaging[6,7]. 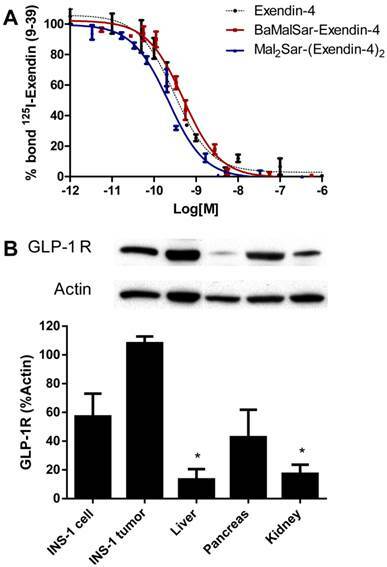 The Glucagon-like peptide 1 (GLP-1) is an incretin peptide released from the intestine in response to nutrient ingestion; its binding to the GLP-1 receptor (GLP-1R) augments glucose-induced insulin secretion from pancreatic β-cells. Although GLP-1 serves as a ligand for GLP-1R, this peptide gets quickly decomposed in vivo, which makes it not suitable for imaging applications. As a more robust and high affinity GLP-1R ligand, exendin-4 is a peptide hormone first isolated by Dr. John Eng in 1992. Exendin-4 displays similar biological properties to human GLP-1, with which it shares 53% sequence identity; however, it is metabolically much more stable than GLP-1, which makes it more suitable for imaging probe construction. Previously, exendin analogues have been labeled with 111In[11-13], 125I, 99mTc, 68Ga[15-17], 64Cu[18,19], and 18F[20-23]. The obtained results have demonstrated promising clinical utility of this imaging approach. Recently, we and others found that dimeric interactions may successfully increase the affinity of ligand-receptor interactions and, thus, significantly improved tumor targeting over the monomeric analogs in many cases[24, 25]. In this study, we constructed two GLP-1R targeted PET probes containing monomeric and dimeric exendin-4 subunit based on the recently developed Sarcophagine chelator[26-29]. The tumor targeting efficacy and in vivo kinetics of the exendin-4 dimer was compared with those of the exendin-4 monomer analog. All commercially available chemical reagents were purchased from Aldrich (St. Louis, MO) and used without further purification. Cys40-exendin-4 was purchased from C S Bio Co. (Menlo Park, CA). 64CuCl2 was obtained from University of Wisconsin (Madison, WI). 125I-exendin(9-39) was purchased from Perkin Elmer (Wellesley, MA). A typical linear gradient HPLC was used for purification and quality control as following. The reversed-phase HPLC using a Phenomenex® Gemini C18 (Torrance, CA) was performed on a Waters system with model 105S single-channel radiation detector (Carroll & Ramsey Associates). At a flow rate of 1 mL/min, the mobile phase was maintained at 95% solvent A [0.1% trifluoroacetic acid (TFA) in water] and 5% B [0.1% TFA in acetonitrile (MeCN)] from 0-2 min and was changed to 35% solvent A and 65% solvent B through 2-32 min. The UV absorbance was monitored at 218 nm. BaMalSar was prepared as previously reported, which is available at KeraFAST, Inc. Cys40-exendin-4 (2.2 mg 0.5 µmol) was added to pH 7.0 phosphate buffer containing 0.4 mg BaMalSar (0.6 µmol) (Fig. 1A). The solution was stirred at room temperature for 1 h and the product was purified by HPLC (Rt: 22.23 min). The product was characterized by LTQ FT mass spectrometry (Thermo, Waltham, MA) (BaMalSar-exendin-4: m/z 4992.52 for [MH]+, C223H338N60O67S2, calculated [MH]+: 4992.43). Synthesis scheme of monomeric and dimeric exendin-4 analogs: (A) BaMalSar-exendin-4 and (B) Mal2Sar-(exendin-4)2. Mal2Sar was prepared as previously reported. Cys40-exendin-4 (3.3 mg, 0.8 µmol) was added to phosphate buffer (pH 7.0) containing Mal2Sar (0.3 mg, 0.36 µmol) (Fig. 1B). The solution was stirred at room temperature and the product was purified by HPLC (Rt: 13.08 min). At a flow rate of 1 mL/min, the mobile phase was maintained at 70% solvent A [0.1% TFA) in water] and 30% B [0.1% TFA in MeCN] from 0-2 min and was changed to 35% solvent A and 65% solvent B through 2-37 min. The product was characterized by LTQ FT mass spectrometry (Thermo, Waltham, MA) (Mal2Sar-(exendin-4)2: m/z 9402.64 for [MH]+, C416H630N112O130S4, calculated[MH]+: 9402.50). BaMalSar-exendin-4 and Mal2Sar-(exendin-4)2 (10 μg) were incubated with 74 MBq of 64Cu2+ in 0.1 M sodium acetate buffer (pH 5.5) for 30 min at 37°C. 64Cu-labeled peptide was subsequently purified by analytical HPLC and the radioactive peak containing the desired product was collected. After removal of the solvent by rotary evaporation, the conjugated peptide tracer was reconstituted in 1 mL phosphate buffer saline (PBS, 1x, Mediatech, Manassas, VA) and passed through a 0.22 μm syringe filter for in vivo animal experiments. The decay-corrected radiochemical yield (RCY) for 64Cu-BaMalSar-exendin-4 and 64Cu-Mal2Sar-(exendin-4)2 was more than 90%. To determine the lipophilicity of 64Cu-BaMalSar-exendin-4 and 64Cu-Mal2Sar-(exendin-4)2, the final products were diluted in 500 µL PBS (1X) and an equal volume of octanol was added. After mixing vigorously for 10 min, the mixture was separated by centrifugation (5 min; 5000 rpm). Counts in aliquots (n=3) of the organic and inorganic layers were determined using a gamma counter (Packard). The log P values were reported as an average plus the standard deviation. Rat insulinoma cell line INS-1 (GLP-1R positive, kindly donated by Dr. Ian Sweet, University of Washington, Seattle, WA) was maintained under standard conditions: the INS-1 cells were grown in RPMI-1640 medium supplemented with 10% fetal bovine serum (Atlanta Laboratories, Atlanta, GA), 20mM Hepes, 2mM L-glutamine, 1mM Sodium-pyruvate, 2 mM L-Glutamine, 1 % antibiotic-antimycotic solution (Mediatech, Manassas, VA), and 50 mM 2-mercaptoethanol at 37 °C in humidified atmosphere containing 5% CO2. The INS-1 cells were grown in culture until sufficient cells were available. The in vitro GLP-1R-binding affinity and specificity of BaMalSar-exendin-4, Mal2Sar-(exendin-4)2 and exendin-4 were assessed via competitive cell binding assays using 125I-exendin(9-39) (PerkinElmer, Waltham, MA) as the GLP-1R specific radioligand based on reported procedure. In detail, INS-1 cells were harvested, washed three times with PBS, and resuspended (2 × 106 cells/mL) in the binding buffer. Filter multiscreen DV plates (96-well, pore size, 0.65 μm, Millipore, Billerica, MA) were seeded with 105 cells and incubated with 125I-exendin(9-39) (0.74 kBq/well) in the presence of increasing concentrations of different exendin-4 analogues (0-1.0 μmol/L). The truncated exendin(9-39) is an antagonist of GLP-1R and a competitive inhibitor of exendin-4. The total incubation volume was adjusted to 200 μL. After the cells were incubated for 2 h at room temperature, the plates were filtered through a multiscreen vacuum manifold and washed three times with binding buffer. The hydrophilic polyvinylidenedifluoride (PVDF) filters were collected, and the radioactivity was determined using a gamma counter. The best-fit 50% inhibitory concentration (IC50) values for INS-1 cells were calculated by fitting the data with nonlinear regression using GraphPad Prism (GraphPad Software, La Jolla, CA). Experiments were performed on triplicate samples. Male, NOD/SCID mice (the City of Hope Animal Resource Center, Duarte, CA), 8-10 weeks old, served as recipients for insulinoma cells. All animal experiments were performed in compliance with the Guidelines for the Care and Use of Research Animals established by the City of Hope/Beckman Research Institute's Animal Use Committee. Xenograft tumor model. NOD/SCID mice were injected with INS-1 rat insulinoma cells (5 × 106, suspended in 0.1 ml of 1x phosphate buffered saline) subcutaneously in the thigh. Tumors were established within 18-21 days post-injection. Blood glucose values were monitored daily and 6% glucose solution was fed ad libitum once the blood glucose level was lower than 3.3 mmol/L. Cultured INS-1 cells, INS-1 tumors and organs (liver, pancreas and kidney) harvested from NOD/SCID mice were washed twice with ice cold PBS, flash frozen in a dry ice methanol bath and stored at -80 oC until use. Frozen stored cells and minced tissues were lysed with lysis buffer. Whole cell lysates containing equivalent amount of protein were separated by SDS-PAGE and western blot was performed as described previously. Rabbit polyclonal antibodies directed against GLP-1R (Abcam, San Francisco, CA) and β actin (Cell Signaling Technology, Danvers, MA) were used at 1:1000 dilution. Densitometric analysis of immunoblots was performed with the NIH image software (ImageJ). microPET imaging of 64Cu-BaMalSar-exendin-4 and 64Cu-Mal2Sar-(exendin-4)2 were performed in mice bearing INS-1 tumor to evaluate the in vivo specific binding to GLP-1R (n=3). For blocking studies, exendin-4 (20 μg) was co-injected with the radiotracers. For microPET imaging, mice were injected via the tail vein with 3.7-7.4 MBq of 64Cu-BaMalSar-exendin-4 or 64Cu-Mal2Sar-(exendin-4)2. Serial imaging of INS-1 tumor (at 1, 4 and 24 h; scan duration 10, 10 and 30 min, respectively) was performed using a microPET R4 scanner (Concorde Microsystems, Knoxville, TN; 8 cm axial field of view, spatial resolution 2.0 mm) using previously reported procedures. Images were reconstructed by use of a 2-dimensional ordered-subsets expectation maximization (OSEM) algorithm using the microPET Manager Software (Concorde Microsystems, Knoxville, TN). No background correction was performed. Regions of interest (ROI) were drawn over the tumor on decay-corrected whole-body coronal images. The maximum counts per pixel per minute were obtained from the ROI and converted to counts per milliliter per minute by using a calibration constant. With the assumption of a tissue density of 1 g/ml, the ROIs were converted to counts per gram per min. Image ROI-derived %ID/g values were determined by dividing counts per gram per minute by injected dose. Images were then analyzed using the Acquisition Sinogram Image Processing (ASIPro) software (Concorde Microsystems, Knoxville, TN). Xenograft INS-1 tumors were collected and fixed with 10% formalin for paraffin embedding. 5-μm parallel sections were stained with hematoxylin and eosin or immunostained for insulin and GLP-1R, as described previously[7, 32]. Guinea pig anti-human insulin (DAKO, Carpinteria, CA) and rabbit anti-human GLP-1R (Novus Biologicals, Littleton, CO) were used as primary antibodies. The corresponding secondary antibodies were conjugated with FITC or Texas Red (Jackson Immunoresearch, West Grove, PA). The slices were counter-stained for DNA with diamidino-phenylindole (DAPI) (Sigma, St. Louis, MO) and visualized with an Olympus BX51 fluorescent microscope equipped with a Pixera 600 camera. Quantitative data were expressed as mean ± SD. Means were compared using one-way ANOVA and Student's t test. P values <0.05 were considered statistically significant. 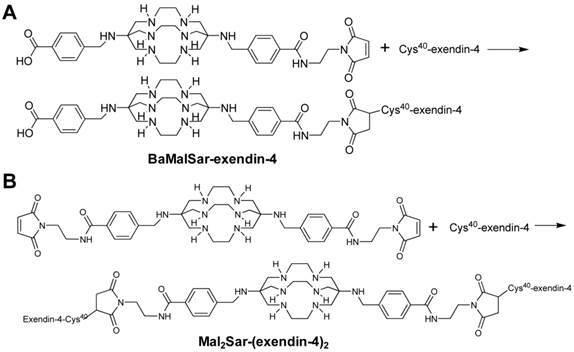 BaMalSar and Mal2Sar were conjugated with Cys40-exendin-4 to give BaMalSar-exendin-4 and Mal2Sar-(exendin-4)2 in 90% yields, respectively (Fig. 1). The products were purified by HPLC and characterized by mass spectrometry. The purity of each exendin-4 conjugate was determined to be > 95% by HPLC. The 64Cu labeling procedure was done within 1 h (including radiolabeling, HPLC purification, solvent evaporation, and reconstruction in PBS) with a decay-corrected yield higher than 90% and more than 98% radiochemical purity. The specific activity of purified 64Cu-BaMalSar-exendin-4 and 64Cu-Mal2Sar-(exendin-4)2 were estimated to be 33 GBq/µmol and 67 GBq/µmol, respectively. The log P values for 64Cu-BaMalSar-exendin-4 and 64Cu-Mal2Sar-(exendin-4)2 were determined to be -2.33 ± 0.08 and -2.06 ± 0.09. We compared the receptor-binding affinity of BaMalSar-exendin-4 and Mal2Sar-(exendin-4)2 with that of exendin-4 using a competitive cell-binding assay (Fig. 2A). Both peptides inhibited the binding of 125I-exendin(9-39) to GLP-1R positive INS-1 cells in a dose-dependent manner. The IC50 values for Mal2Sar-(exendin-4)2, BaMalSar-exendin-4, and exendin-4 were determined to be 173.1 ± 79.0 pmol/L, 500.0 ± 134.6 pmol/L and 303.3 ±1.7 pmol/L. The results demonstrated that sarcophagine cage conjugation had a minimal effect on the receptor-binding affinity for exendin-4. Mal2Sar-(exendin-4)2 has higher binding affinity than BaMalSar-exendin-4 in vitro, which could be caused by polyvalency effect. The western blot result demonstrated that the liver and kidney has very low GLP-1R expression in NOD/SCID mice and insulinoma (INS-1) has high GLP-1R expression, which is similar with the previous report. Pancreas also has high GLP-1R expression, which makes GLP-1R as an attractive target for non-invasive imaging islets. Static microPET scans were performed on a INS-1 tumor model and representative decay-corrected coronal images at 1, 4 and 24 h after tail vein injection of 64Cu-BaMalSar-exendin-4 and 64Cu-Mal2Sar-(exendin-4)2 are shown in Fig. 3 and 4, respectively. The INS-1 tumors were clearly visualized with good tumor-to-background contrast for both tracers. The uptake in the tumor or other organs was measured from the ROI analysis and shown in Fig. 5. For 64Cu-BaMalSar-exendin-4, the tumor uptake was 11.16 ± 2.71, 11.41 ± 2.91, and 8.07 ± 2.74 %ID/g at 1, 4 and 24 h p.i., respectively. For 64Cu-Mal2Sar-(exendin-4)2, the tumor uptake was 21.03 ± 5.06, 23.29 ± 5.35 and 22.92 ± 5.64 %ID/g at 1, 4, and 24 h p.i., respectively. The tumor uptake of 64Cu-Mal2Sar-(exendin-4)2 was significantly higher than that of 64Cu-BaMalSar-exendin-4 (P < 0.05, Fig. 5) at all time points examined. Both tracers cleared rapidly from the blood, and demonstrated high kidney uptake. The liver uptakes of 64Cu-BaMalSar-exendin-4 and 64Cu-Mal2Sar-(exendin-4)2 were significantly lower than tumor and kidneys at all time-points. The liver uptake of 64Cu-Mal2Sar-(exendin-4)2 (6.07 ± 0.72, 7.17 ± 0.58 and 7.89 ± 0.78 %ID/g at 1, 4 h and 24 h p.i., respectively) was significantly higher than that of 64Cu-BaMalSar-exendin-4 (2.51 ± 0.46, 3.07 ± 0.79 and 3.02 ± 0.91 %ID/g at 1, 4 h and 24 h p.i., respectively), which could be attributed to the larger size of Mal2Sar-(exendin-4)2. The nonspecific uptake in the muscle and lung was very low for both tracers. The GLP-1 targeting specificities of 64Cu-BaMalSar-exendin-4 and 64Cu-Mal2Sar-(exendin-4)2 were demonstrated by blocking studies (Fig. 3 and 4). Co-injection of excess amount of exendin-4 significantly lowered the tumor uptake for 64Cu-BaMalSar-exendin-4 and 64Cu-Mal2Sar-(exendin-4)2. For example, at 1 h p.i., the tumor uptake of 64Cu-BaMalSar-exendin-4 with blocking dose of exendin-4 agent is 1.41 %ID/g (vs. 11.16 %ID/g without exendin-4). The tumor uptake of 64Cu-Mal2Sar-(exendin-4)2 is 1.49 %ID/g with the blocking exendin-4 agent (vs. 23.29 %ID/g without exendin-4). Insulinoma is the most common functional pancreatic neuroendocrine neoplasms and is derived from beta cells and secretes insulin. 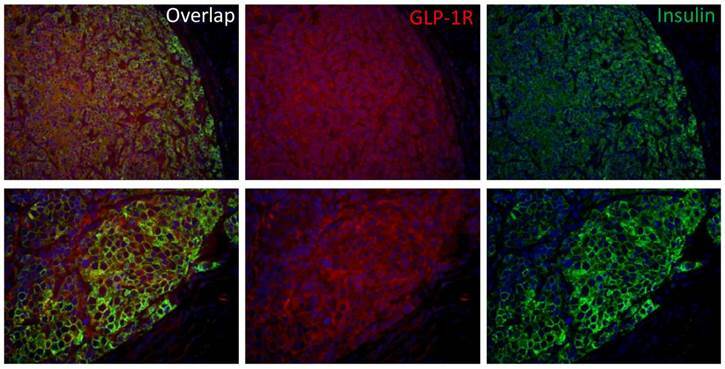 GLP-1R and insulin double staining (Fig. 6) confirmed that the INS-1 tumor has high GLP-1R expression and the tumor uptake was due to GLP-1R targeting effect. (A) Inhibition of 125I-exendin(9-39) binding to GLP-1R on INS-1 cells by BaMalSar-exendin-4, Mal2Sar-(exendin-4)2 and Exendin-4. Data are mean ± SE (n = 3). (B) Western blot analysis of GLP-1R expression in INS cells, INS-1 tumor tissue and major organs. Data is shown as mean ± SE (n=3), * p<0.001 vs. Tumor. Small-animal PET studies of INS-1 tumor-bearing mice. Decay-corrected whole-body coronal images of NOD/SCID mice bearing INS-1 tumor at 1, 4 and 24 h after injection of 64Cu-BaMalSar-exendin-4 without (control, left) and with unradiolabeled exendin-4 (blocking, right). Small-animal PET studies of INS-1 tumor-bearing mice. Decay-corrected whole-body coronal images of NOD/SCID mice bearing INS-1 tumor at 1, 4 and 24 h after injection of 64Cu-Mal2Sar-(exendin-4)2 without (control, upper panel) and with unradiolabeled exendin-4 (blocking, lower panel). Quantitative analyses of small-animal PET data. Time activity curves (TACs) of 64Cu-BaMalSar-exendin-4 and 64Cu-Mal2Sar-(exendin-4)2 on (A) tumor, (B) kidney, and (C) liver. The Glucagon-like peptide 1 receptor (GLP-1R) has become an important target for imaging due to its elevated expression profile in pancreatic islets, insulinoma, and the cardiovascular system. Because native GLP-1 is degraded rapidly by dipeptidyl peptidase-IV (DPP-IV), several studies have conjugated different chelators to a more stable agonist of GLP-1 (such as exendin-4) as PET or SPECT imaging agents with various advantages and disadvantages. Although various monomeric exendin-4 derivatives have been radiolabeled for imaging applications[10-23], the recent development of dimeric exendin-4 clearly demonstrated the feasibility to improve GLP-1R binding affinity using polyvalency concept. In this study, we constructed 64Cu labeled monomeric and dimeric exendin-4 as two GLP-1R targeted PET probes based on the recently developed sarcophagine chelator. With a halflife of 12.7h, 64Cu is well suited for the radiolabeling of peptides, proteins, and antibodies. Recently, it has been demonstrated that sarcophagine 64Cu2+ complexes are superior to other chelators such as DOTA with respect to in vivo stability[26, 27, 35]. The sarcophagine cage has two reactive sites on either end of its cage, which make it an efficient platform for constructing multimeric imaging probes. Recently, we have developed two thio-reactive sarcophagine chelators named BaMalSar and Mal2Sar. As shown in Fig. 1, monomeric and dimeric exendin-4 could be successfully synthesized through thiol-maleimide reaction based on these chelators. To evaluate the effect of polyvalency, in vitro cell binding assay was performed using INS-1 cell (high GLP-1R expression). As expected, Mal2Sar-(exendin-4)2 demonstrated 3 fold increase in receptor binding affinity compared with BaMalSar-exendin-4 due to polyvalency effect. 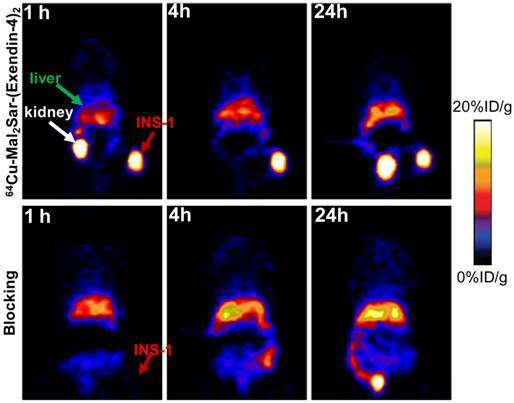 Furthermore, in vivo microPET imaging showed that the tumor targeting efficacy of 64Cu-Mal2Sar-(exendin-4)2 was greater than that of 64Cu-BaMalSar-exendin-4. Both 64Cu-Mal2Sar-(exendin-4)2 and 64Cu-BaMalSar-exendin-4 have relatively low cell uptake (Supplementary Material: Fig. S1). 64Cu-Mal2Sar-(exendin-4)2, showed slightly slower blood clearance than 64Cu-BaMalSar-exendin-4 (Supplementary Material: Fig. S2). 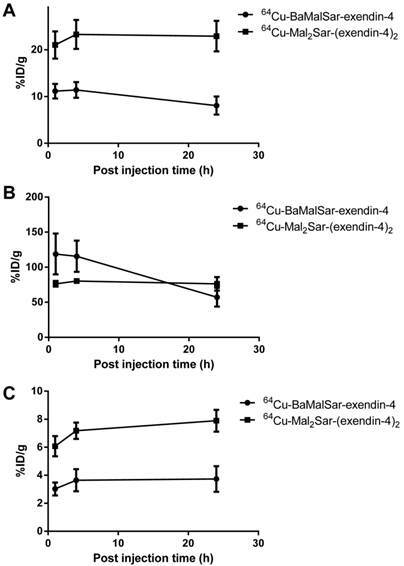 64Cu-Mal2Sar-(exendin-4)2 and 64Cu-BaMalSar-exendin-4 have similar metabolic stability (Supplementary Material: Fig. S3). The larger molecular size of 64Cu-Mal2Sar-(exendin-4)2, along with the stronger target binding affinity, may be attributed to its higher tumor uptake, compared with that of 64Cu-BaMalSar-exendin-4. The receptor specificity was successfully demonstrated by blocking experiment. In the presence of cold exendin-4, tumor uptakes of both monomer and dimer were significantly reduced. 64Cu-Mal2Sar-(exendin-4)2 has much higher liver uptake compared with 64Cu-BaMalSar-exendin-4, which may be due to the increased molecular weight instead of GLP-1R targeting effect. The western blot result (Fig. 2) demonstrated that liver has very low GLP-1R expression, indicating the liver uptake was not GLP-1R mediated. Similar to other radiometal labeled exendin-4[10-13,15-17], high and persistent kidney uptake was observed for both 64Cu-Mal2Sar-(exendin-4)2 and 64Cu-BaMalSar-exendin-4. Due to low GLP-1R expression in kidney, renal uptake could not be blocked by excess amount of non-radiolabeled exendin-4. For both imaging and therapeutic applications, it is important to have high tumor-to-kidney ratios, as well as high absolute tumor uptake and persistent tumor retention. For imaging purposes, detection sensitivity around the kidney area will be reduced due to spill over signal from renal area. For therapeutic application, prominent renal uptake would limit the maximum tolerated doses that can be administered due to radiation exposure. Thus, further modification is needed to improve the pharmacokinetics of these 64Cu labeled exendin-4 radiopharmaceuticals. By inserting a bifunctional linker (such as PEG) between the sarcophagin chelator and the exendin multimer as a pharmacokinetic modifier, we may be able to modulate the overall blood circulation half-life, hydrophilicity, and molecular charges of the radioconjugates, which may possibly improve in vivo pharmacokinetics without compromising the tumor-targeting capability. A peptide linker that could be specifically cleaved by kidney would also be considered in our future research. Since 111In labeled exendin analogue has been used in clinical trial, the radiation exposure caused by 64Cu should be manageable. The kidneys will be the major organ responsible for dose-limiting toxicity according to our preliminary data. It has been shown, however, that the kidney uptake of radiometal-labeled exendin-4 can be significantly reduced by the administration of a plasma expander such as Gelofusine and PGA[15, 39] without an additive effect on GLP-1R targeting of radiolabeled exendin-4. Nonetheless, an imaging probe with lower kidney accumulation is preferred. Although we used a stable Cu chelator for GLP-1R targeted imaging, the exendin-4 peptide motif has limited stability in vivo. Other peptide analogs with increased stability might worth exploring further. Immunofluorescence staining of GLP-1R expression in INS-1 tumor tissue. INS-1 tumor was stained with hematoxylin/eosin (blue), insulin (green) and GLP-1R (red) (top panel: 20X; bottom panel: 40X). Sarcophagine cage conjugated exendin-4 demonstrated persistent and specific uptake in INS-1 insulinoma model. Dimerization of exendin-4 could successfully lead to increased tumor uptake in vivo. With high kidney radioactivity levels, both 64Cu-BaMalSar-exendin-4 and 64Cu-Mal2Sar-(exendin-4)2 may need further optimization before clinical translation. This work was supported by the grant from the Juvenile Diabetes Research Foundation International (JDRF-37-2009-20), Jonas Bros Foundation, the American Cancer Society (121991-MRSG-12-034-01-CCE), and the USC Department of Radiology.